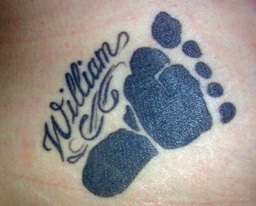 Perhaps the most permanent way to commemorate a baby’s footprints is through a tattoo. Talk about your lasting impressions! Below is a photo of a tattoo by Lisa Henderson of The Wizard’s Den in Petawawa, Ontario, Canada. The baby’s mom had the exact footprint of her newborn tattooed on her back and is very pleased with the results. It’s common for the child’s name to be added above, below or even on a banner through the footprint image. Be sure to consider a type style or “font” before visiting the tattoo studio, or ask the artist to show you some examples of both script and plain-text lettering. Size, too, is an issue. Do you want a discreet tattoo on your ankle or shoulder blade area, or something more prominent? This gentleman (below) chose to have his baby’s handprints tattooed on his chest. The work was done by skilled tattooist Stuart Francis, www.funkytat.com. 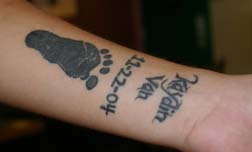 Below is a photo of a forearm tattoo in which the baby’s actual footprint was used as the example for the tattoo, which was done at a studio in Redding, California that has since closed. The boy’s birthdate and name is also included. While many reputable tattoo artists are reluctant to tattoo names of loved ones, most will make an exception for the name or image of the subject’s own child. 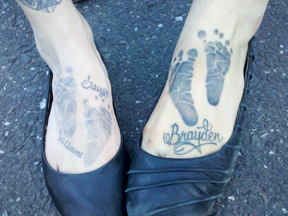 In the photo below, this mom has the footprints of three children tattooed on her own feet.